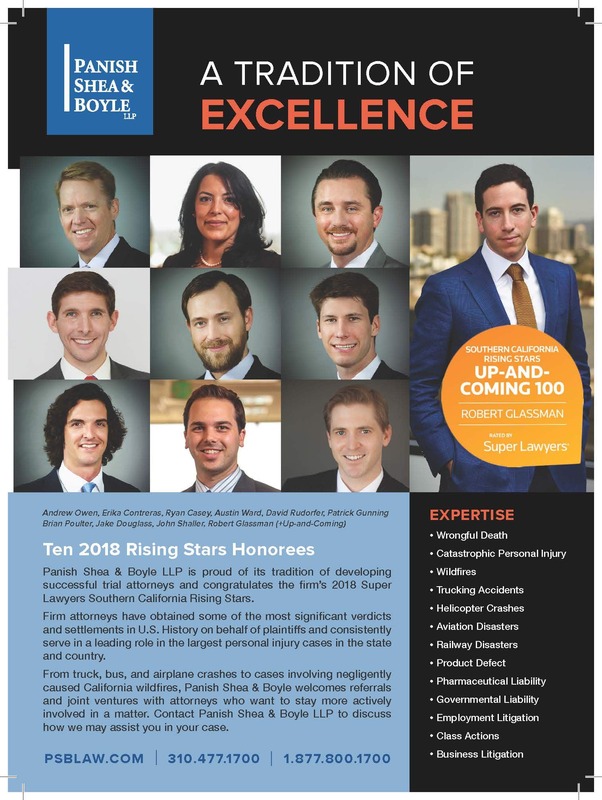 Super Lawyers has named 10 Panish Shea & Boyle LLP attorneys to its annual Southern California Rising Stars list in the areas of Personal Injury – General and/or Personal Injury – Products for 2018. Attorneys honored with this recognition and pictured left to right include: Andrew Owen, Erika Contreras, Ryan Casey, Austin Ward, David Rudorfer, Patrick Gunning, Brian Poulter, Jake Douglass, John Shaller and Robert Glassman. For the third consecutive year, Attorney Glassman was also named to the Up-and-Coming 100: 2018 Southern California Rising Stars – a compilation of lawyers who ranked at the top of the Rising Stars list. To be eligible for the Rising Stars list, a candidate must be either 40 years old or younger and in practice for 10 years or less. No more than 2.5 percent of attorneys in the state are named to the Super Lawyers Rising Stars list.